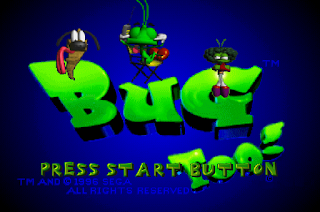 I've played a Sega Saturn probably less than five times in my life and as far as I can remember, I have never played Bug Too! before (though my neighbor across the street might've had it now that I think about it). Well in any case, I've played [some of] it now and I'm here to tell you what I think! I'll also refrain from using exclamation points from now on whenever possible, even though the game's title does unnecessarily contain one. Basically, it's a 3D platformer akin to Crash Bandicoot. You play as a bug starring in a series of movies. 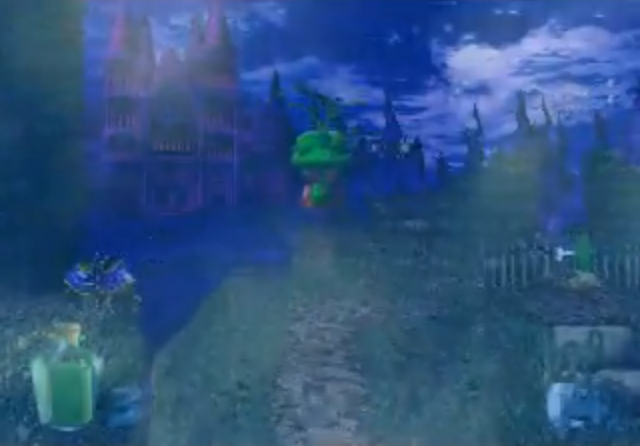 Each movie makes up a world and contains a few levels with bosses at the end of them. As you progress through each level, you can collect diamonds and other trinkets to increase your score which determines how much money the movie earns. I've yet to discover why making a high grossing movie matters or, really, how the levels being movie sets really affects the gameplay at all. As a kid, I might have been excited to explore any 3D game world, but playing this game now, I can't help but wonder at some of the design choices. Rather than being able to run around freely in the 3D environment, your character will often be confined to a 2D plane and can only change direction at specific junctions. On the one hand, this keeps you from falling off the sides, but on the other hand it severely limits your mobility and is not implemented well. You will frequently encounter areas where you'll want to jump down from a ledge but find that you can't due to an invisible wall. Seriously, there are invisible walls everywhere. In one early puzzle, you have to push a lever to rotate a cube further on. In any normal game, any surface of the cube would allow you to walk on it and get to any adjacent area, but in Bug Too! 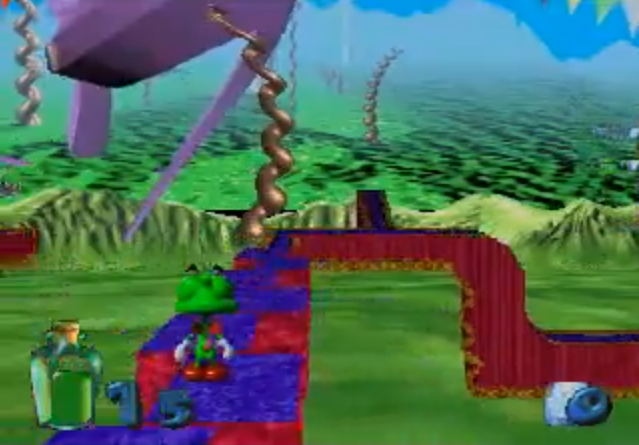 you'll only be able to walk on the parts that have a slightly different colored path. To make matters worse, you can walk up and down walls, which would be cool normally, but as with moving anywhere in this game, you'll only be able to do it if the game wants you to. The puzzles and platforming aren't exactly difficult; they just waste your time by making you run back and forth. Then there's the first boss which, unlike most enemies up to that point, hurts you when you jump on it and can only be damaged by a new move you only acquire for the first time during the fight (as far as I could tell). When it comes to the graphics and audio, Bug Too! is hit or miss. The graphics aren't too bad as a whole, but the lack of visual cues for where you can and can't go is a huge oversight. The music also isn't bad, but it inexplicably fades out rather than smoothly looping like any other game's music. The characters also talk and say one-liners every now and then, which I guess you could count as a positive if you're feeling generous. In spite of all my criticisms, Bug Too! isn't a terrible game. It's just not a very good game. When it was new, I'm sure I would have enjoyed it as I would have any 3D platforming game. Even now, there's some fun to be had here. It's just that there are so many faults that you may as well play one of the many better alternatives.